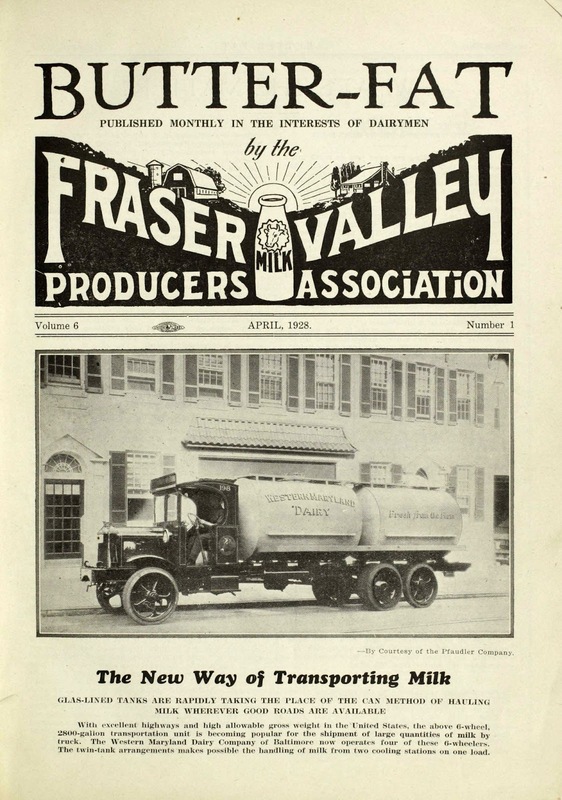 The internet is opening up the world of research and just recently the BC Dairy Historical Society digitized and made available for viewing online the 674 editions of the Butter-Fat magazine published by the Fraser Valley Milk Producers' Association from 1923 to 1993. 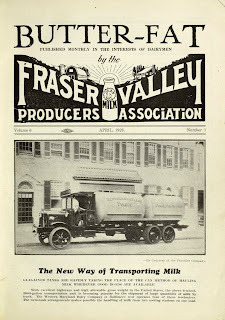 The Butter-Fat editions contain a detailed history of dairy and agriculture in BC including several historical editions with wonderful historic photographs. The editions are in PDF format and can be downloaded to your PC, iBooks or Kindle for reading and searching. My family was very involved in the dairy industry as Jersey farmers, with 4H, and later working for the goverment in the agriculture department so I did search was rewarded with several results. The 1924 February edition shows me that my grandfather had some very interesting names for his cows, Rosewood Model Kitty, Dorothy's Dimple Dot, Valentine's Bonny Maid, and Dora's Golden Lass. My dad has explained the naming convention is that first name is the name of the farm, the lineage, the name. In their case they didn't have a farm name so I can see that he named some of them for my grandma Dorothy. Apparently Fauvic Baroness St. Mawes made the Jersey records in 1928 for milk production. Look at this gem from the July 1927 edition. It includes this great group shot from a F.V.M.P.A. field day and picnic in Chilliwack. I have much more to explore and I am looking foward to the journey.